Small stage - a perfect place for events such as concerts, lectures, etc. Open pergola - with benches facing east and west. 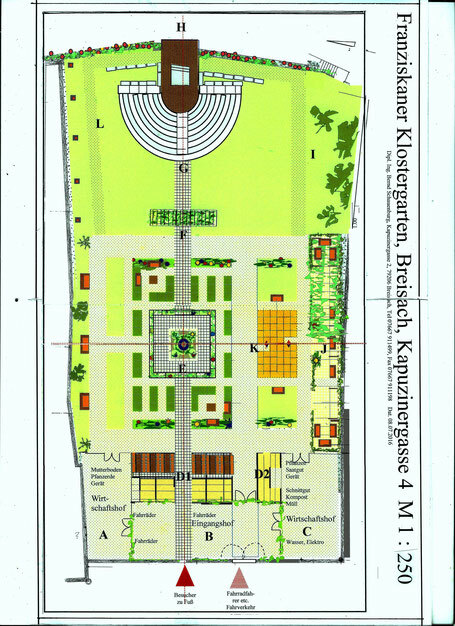 Physics garden - a central fountain surrounded by beds of medicinal herbs, vegetables and cereal crops, and flowers. Along the walls - benches, shrubs and flower borders. Picnic area - with tables and benches underneath a pergola. Covered area - to store equipment and materials. Courtyard - working area with compost heap, nurseries and further storage. Entry - with space to lock up bikes.